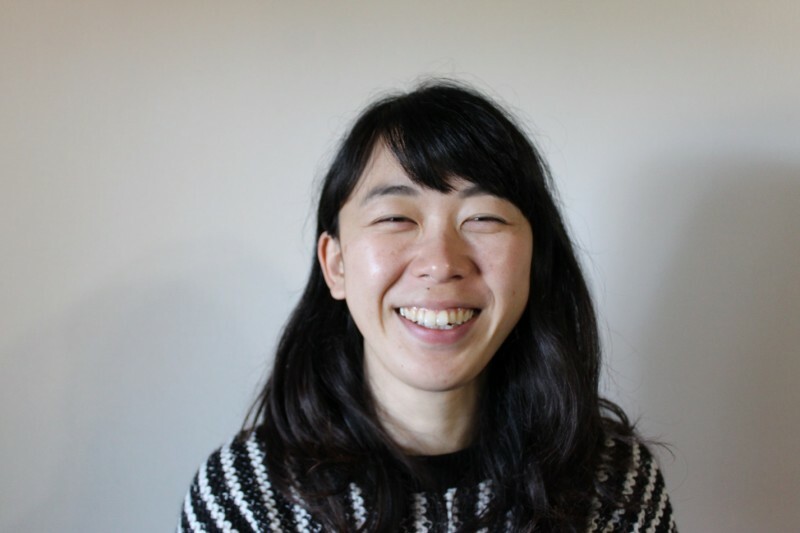 My name is Keiko Masumoto. I was born in Tatsuno, Hyogo, in 1982. I graduated from the faculty and master of fine arts, Kyoto City University of Arts. I worked in Kyoto for about 10 years, after Kyoto, I worked as a guest artist at the University of the Arts in Philadelphia, America, then as a studio artist in a Shiga prefectural park The Shigaraki Ceramic Cultural Park after that as an intern assistant at Kobe design university and also I have been the resident artist at Victoria & Albert Museum (V&A) in the UK. Now I make my works in Shigaraki. Can you tell us about how you started this kind of work? I saw a “crane pot” by Jyousei, a Senge tea kettle caster from the second generation of Onishi family and was impressed by the strong presence of that crane motif. What was Jyousei trying to make? A crane or a pot? The balance between the crane and the pot was breathtaking. 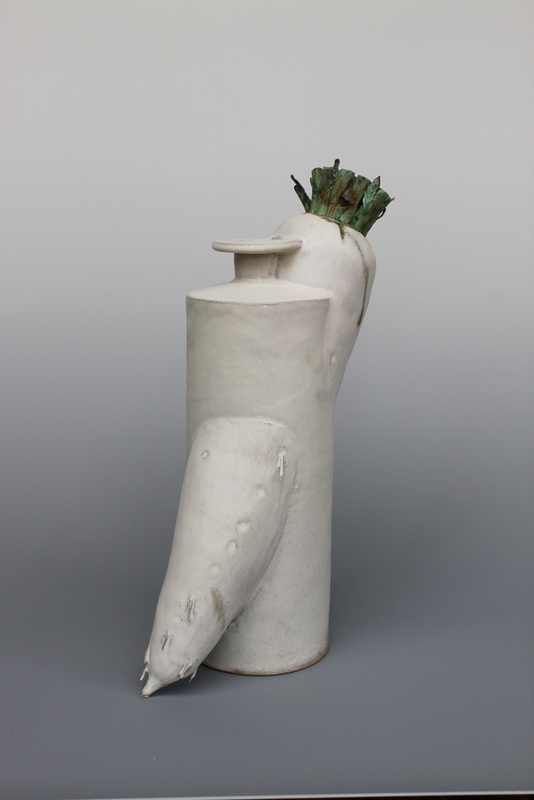 From there, I had an idea to make work that connects the pot (vessel) and the crane (decoration) in a more exaggerated and interesting way. Where do you get your ideas from? How do you develop your motif? 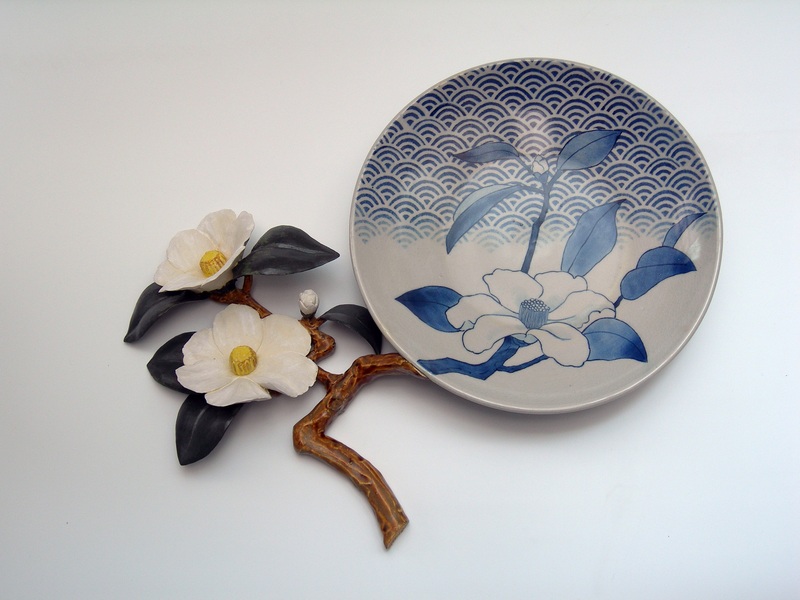 I choose my motif from decorative parts on ancient pottery or from things I like in daily life. 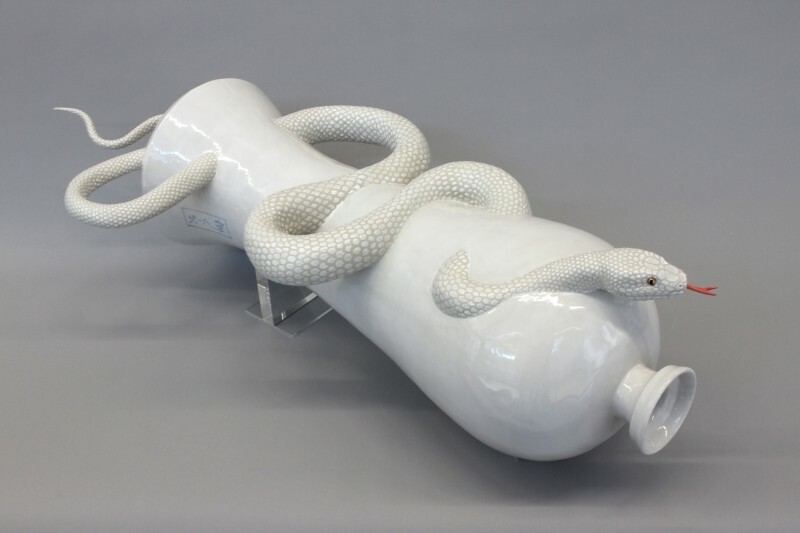 Take my works of snake for example, I made a lot of snake motif themed work in the year of the snake. How long does it take to design a piece of work? How long does it take to produce it? Can you tell us a little about the production process? For the ideas of my work, I start from searching vessels that might be helpful and collecting data for a motif, and then draw a blueprint. Next, I make a small maquette base on the blueprint to help me consider the structure of the vessel and motif. When the structure is decided, I start to augment the work to it’s real size. For a large work, before using clay to make it, can take about two weeks to do the preparation, including moving the work, firing (pottery), packing, making necessary tools and structures. Most of my works are hand-form using coil method. Recently, I also asked someone for a potter’s wheel to throw ceramics as well. For motif/vessel works, I attach a motif after the vessel is completed. The Plate series uses a similar process. For the vessel/motif works, after the motif, I cut the wooden guide according to the vessel’s outline and cut off the residual parts. For compressed patterns, after the motif is completed, I compress the still soft vessel into a mould for shaping. The time for each work varies. For a very large size work, it takes about 2 months from having an idea to completion. Could you tell me more about the method of ceramics that you work. As I mentioned earlier, most of my works made with pinch method which is literally pinch a clay to make a shape. However there are two other methods that I use often, one is Tatara (=slab) and other one is Rokuro (=throwing) method. What is your most popular work? I thought the “Castle Shadow” is really interesting, can you tell us a bit about this one? “Castle shadow” was the initial work for a pot/motif series. The motif is from Himeji castle in my hometown. I thought it would be interesting if I could contrast the straight lines of the castle with the soft curves of a pot. To build the shape of castle, I ordered a paper crafted version of Himeji castle, made hexenhaus of biscuits, and then cut a slab of clay according to the paper model. I had hard time to doing details. I also thought that the Plate Series is quite unique. Where did you get the original idea for this? For my first personal exhibition, I wanted to put some of my work on the wall; this was how I came up with the idea of the Plate Series. I used the flat character of the plates to protrude the decorative motif in an interesting way, which turned out very well. As you mentioned before, last year you had a residency at the V&A Museum in London. Can you tell us about this experience? How did the visitors react? I had the opportunity to hold several workshops for children at the Hyogo Prefectural Museum of Art. Thanks to this experience, I was given the chance to be a resident artist at the V&A Museum. A key point of being a resident artist in a museum is to connect artists with local society. In addition to the workshop, open studios are also very popular. I even presented my work at the Wales International Ceramic Festival. What would you say is the essential aspect for becoming an artist like yourself? For example, for someone interested in the same career path. Persistence is the most important thing. My ceramic art experience began from the traditional Japanese tea ceremony. When I saw the lovely ceramic incense container which had been made by my tea ceremony teacher, I felt like I wanted to make my own one as well. Moreover, I am moved by the design of utensils used in tea ceremony, probably because I grew up in Japan and feel that Japanese design is better than anywhere else. 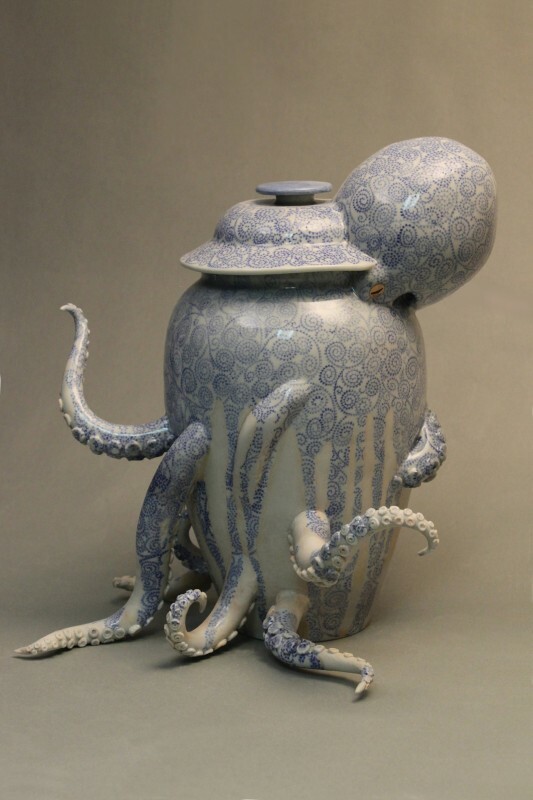 The first thing about my work is that “it looks like pottery.” This objective view is very important as I use traditional Japanese techniques that people can see straightforwardly. I go to craft shops in department stores very often because there are many typical kinds of “pottery” for a majority of people. It’s still an unknown world for me. However, every time I see an ancient craft, I am always attracted to its generosity, boldness and witticism. My father likes a gag, and it’s interesting to know how to use a poor pun delicately. From 25th October to 30th November, I have an ongoing exhibition “Flying out/ container-the world of Keiko Masumoto” which is being held at the Tatsuno City Museum of History and Culture in Hyogo. From 12th November to 18th November, I will participate in a group exhibition “premonition of beauty 2014” at Takashimaya, a store in Nihonbashi Tokyo. Right now, the V&A museum is also exhibiting my work on their pottery floor. The handling of my works is dealt with by ICN Gallery (London) and Gallery Jin (Tokyo). The wide range and long history of Japanese crafts have a great reputation in the world. This is also the background for my work. Please have a look of Japanese work if you have the chance.